What Causes My Cake to Fall When Cooling? Light-colored pans are less likely to cause hard, crunchy edges. 3 What Causes My Cake to Fall When Cooling? A well-baked cake is always a welcome dessert, but achieving the perfect texture can sometimes be complicated. Cakes sometimes develop a hard, dark crust around the edges, where the batter was in contact with the pan. The dark edges are usually dry and overcooked, and leave your cake unattractive and less pleasing on the palate. Prevent this hard crust by making some changes to how you bake your cakes. Use light-colored aluminum pans, rather than glass or dark pans. 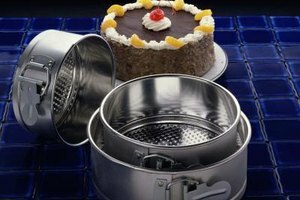 Professional bakers use these pans precisely because they aren't prone to creating hard, darkened crusts. If dark pans are your only option, reduce the oven's temperature by 25 degrees Fahrenheit. Check the accuracy of your oven's thermostat with an oven thermometer. Few ovens are completely accurate, and if yours is running hotter than you thought, it can result in over-baked cakes with hard, crusty edges. Wrap your cake pan with insulating strips. These limit the heat transmitted to your cake batter by the pan, so the edges bake no faster than the middle of your cake. Most kitchenware retailers sell the strips or you can find them online. Check the doneness of your cake diligently, so you don't over-bake it. When your cake is baked, its edges begin to pull away slightly from the pan, it will be lightly springy when tapped, and a cake tester inserted into the middle will come out clean or with a few dry crumbs clinging to it. If the crumbs are doughy, or if damp batter clings to the tester, your cake needs a few more minutes in the oven. Some types of cake are more prone to sticking and hardening than others. If you have a recipe that tastes wonderful but is prone to browning and hardening, buy a silicone cake pan in the correct size. Silicone is an insulating material, and cakes baked in a silicone pan won't form a crust. Larger cakes often form crusty edges because it takes so long for the middle to finish baking. 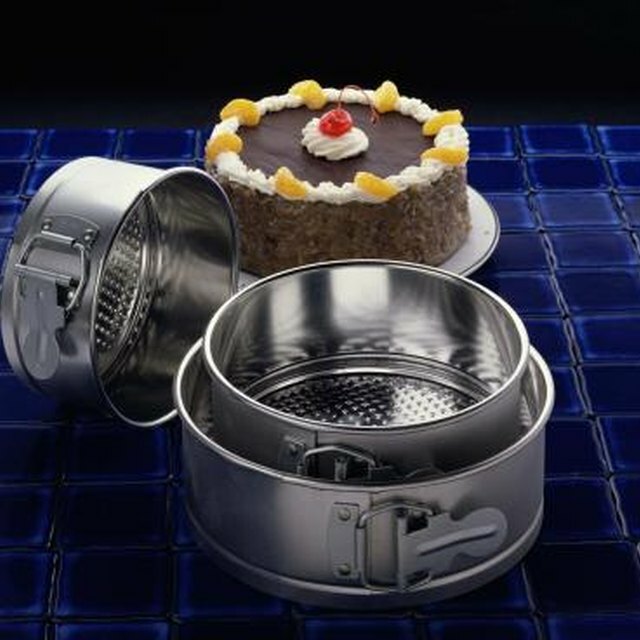 Many manufacturers produce a baker's aid called a heating core, a funnel-shaped metal tool that conducts heat into the middle of the batter. This shortens baking time for the middle of the cake, reducing the likelihood of over-baked edges.